On the road to earning their MD, these medical students are determined to make a difference in the Sint Maarten community. Fourth semester student Kameron Perkins held up a shirt and examined it closely. Finding no holes or tears, he placed it in a clothing pile labeled for men. He continued this routine for the next four hours, sifting carefully through boxes of donations that sat in the Simpson Bay office of the St. Maarten Red Cross. By the end of the day, he and a dozen other American University of the Caribbean School of Medicine (AUC) students had emptied a room full of boxes and organized their contents for the Red Cross’s distribution center. The clothing, they hoped, would soon find a home with a worthy owner. The Red Cross project was one of 16 activities that took place during AUC’s Community Action Day on Saturday, June 16. Other students traveled across the island to provide free HIV screenings, teach health and science lessons to school-aged children, clean up trash from Mullet Bay and local hiking trails, participate in sensory projects with Alzheimer’s patients, and help rebuild and recover spaces impacted by Hurricane Irma. 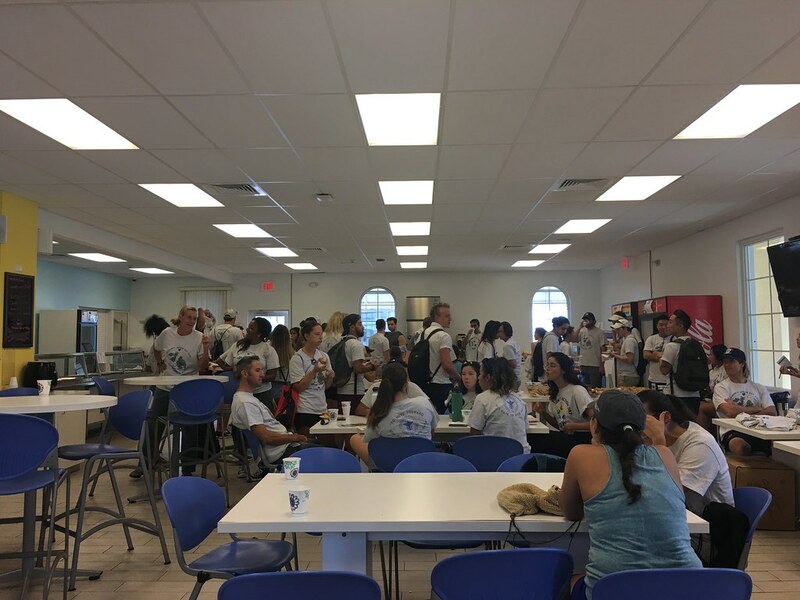 Held three times a year, Community Action Day is an opportunity for the medical school to give back to Sint Maarten and connect students with community organizations and initiatives. That service to community is also a part of AUC’s mission and vision. The school strives to develop socially responsible and culturally aware physicians. In total, 245 students, staff, and AUC family members came out in support of Community Action Day, yielding approximately 775 hours of service. Four months ago, the same number of students donated 765 hours. The president of AUC’s Student Government Association, Moe Ameri, spent his time to IDEAL Preschool in Mary’s Fancy. He and other students cleaned the school’s facilities, repaired toys, put up a shade covering over the playground, and worked on a shared garden area. Since AUC’s return to Sint Maarten following Hurricane Irma, the student body has been particularly active in IDEAL Preschool’s recovery. For Moe and many of his classmates at AUC, that desire to help people is what brought them to medical school in the first place.